Beloved by the Maoris – and Kiwis generally – the New Zealand Greenstone is a major player when it comes to the ‘gift economy’. A type of jade, ‘pounamu’ as it’s commonly known in New Zealand, is hard, durable and highly valued. Used in the past for making tools and weapons, its popularity when it comes to jewellery is timeless. 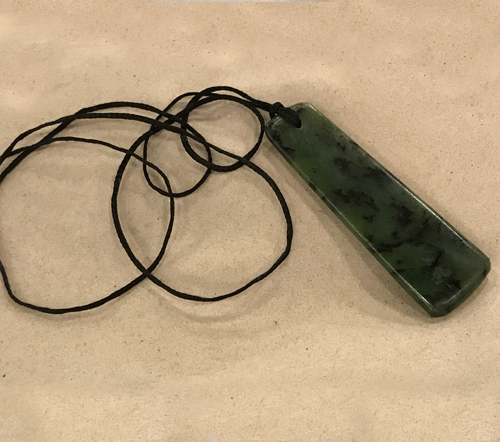 Today, one of the most popular ways to wear greenstone is around the neck (when it’s known as a ‘hei toki’) and it’s said to bring strength and courage to the wearer. Originally, it was used as an everyday tool for cutting and digging – as well as for religious ceremonies. New Zealand stone, crystals and gem expert Robert Simmons says, “Just about everyone in New Zealand has a piece of Greenstone. Bankers, bakers, mystics and carpenters – they all wear it and just about everyone believes it has beneficial powers of healing and protection. Green stones and gems generally are used to attract money, prosperity and wealth. They are also said to be ‘balancing’ stones which promote growth and fertility. Finally, it’s said that you shouldn’t buy Greenstone for yourself – but instead it should be gifted to you. A rather nice tradition perhaps – but a good business model too, for the shops selling it.